Sintra is a popular resort town which is located west of the capital, Lisbon. You have 2 transfer options when travelling from Lisbon airport to Sintra: Taxi and Train. The fastest, but most expensive option is by Lisbon airport taxi. The ride costs around 35€ and takes approximately half an hour. A less convenient, but cheaper option is the train. The total cost of the journey, which involves using the metro as well, costs only 3.65€ and the average travel time is 55 minutes. Welcome Pickups offers meet and greet services and a friendly introduction to Lisbon at the same price as a regular taxi. Click here to see the cost. Taking a Lisbon airport taxi is by far the most convenient and fast method to get from Lisbon airport to Sintra. Licensed Lisbon taxis can be easily recognized by their cream, black or mint green colors and taxi roof signs. Under normal traffic condition, the taxi trip to the town of Sintra should not take more than 30 minutes. Your taxi ride will be charged by a taximeter, depending on the exact location of your destination. There might be extra charges for each piece of luggage, late-night driving or tolls. However, the average price of such taxi trip is 35€. Even though taxi rides can be expensive, hiring a taxi is the best transfer option. Just sit back and enjoy the trip to Sintra without having to worry about stops or losing your belongings. Please keep in mind that Lisbon taxis tend to charge more when travelling outside of the city limits. The urban trains that serve the route from Lisbon to Sintra depart from the Oriente train station, which is located only 3 km away from the airport. In order to get to the train station from the airport just take the metro for 3 stops. The urban trains of CP travel between Lisbon and Sintra every 15 minutes and the average travel time is 47 minutes. How much is the train from Lisbon airport to Sintra? Metro tickets cost 1.45€ and regular urban train tickets for Sintra cost only 2.20€. However, the first time you will have to buy a re-loadable Viva Viagem card for 0.50€ which you can use throughout the public transport network of Lisbon during your stay. Metro and train tickets can be purchased from the ticket counters and automated ticket machines of the airport and train station. Total waiting time is around 25 minutes. The CP urban trains operate the route from Oriente station to Sintra from 05:58 a.m to 01:08 a.m. 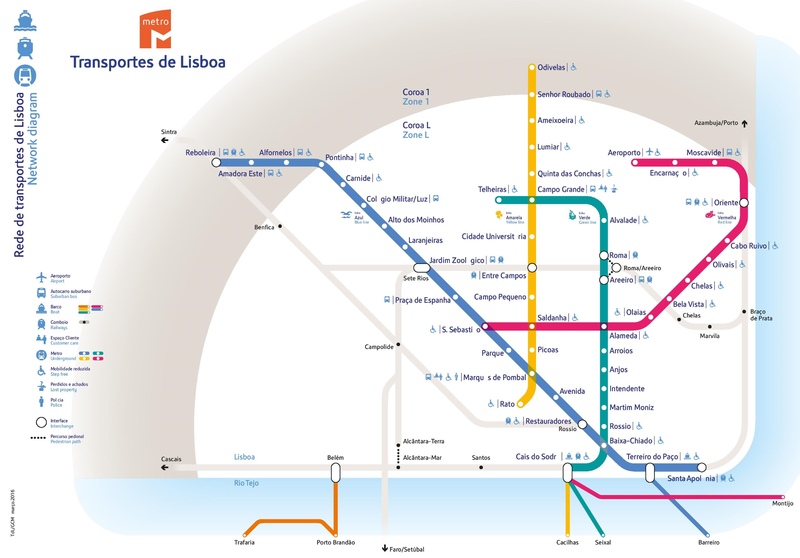 The metro trains of Lisbon run from 06:30 a.m to 01:00 a.m.
Once you arrive at Oriente train station, buy your tickets and check the information screens in order to see from which platform your train departs. If you are on a short budget, the train journey from the airport is ideal for your wallet. However, having to change from the metro to train can be somewhat inconvenient and dangerous if you are travelling with children and many pieces of luggage. If you have some time to spare at Oriente train station, you should know that there is an excellent food court on the top floor and that across the station is the Vasco da Gama shopping centre. The metro and train stations are wheelchair accessible. You can always hire a taxi in order to get from the airport to the train station. The ticket machines accept up to 20€ bills. Oriente station serves all the international train lines. How much is a taxi from Lisbon airport to Sintra? The average price of a taxi trip from Lisbon airport to Sintra is 35€. Without traffic, the ride takes around 30 minutes. How much is a train ticket from Lisbon airport to Sintra? There is no train that travels from the airport to Sintra. First, you will have to get to Oriente station and take the urban train from there. Regular train tickets cost 2.20€ per person. How far is it from Lisbon airport to Sintra? Sintra town is approximately 29 km from Lisbon airport and you can get there either by taxi, or train.